At Living Tongues Institute, we have collaborated with the Siletz Dee-ni tribe in Oregon for the past 7 years, to create the Siletz Dee-ni Talking Dictionary. 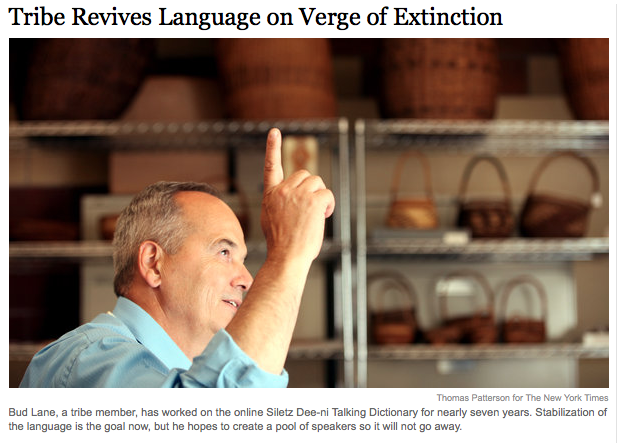 This project, along with other Siletz language revitalization efforts, was recently featured in the New York Times. Check out the full article here. We recommend listening to the audio clips on the left side of the screen, so you can hear Bud Lane’s English translations of some very interesting Siletz terms! This entry was posted in Digital Resources, Endangered Language Activism, Enduring Voices Project, Gregory D. S. Anderson, Indigenous Language Activists, K. David Harrison, Language Hotspots, Launches and Public Events, Media and Publicity, Support Endangered Languages, Talking Dictionaries and tagged Bud Lane, coast salish culture, Dr. Gregory D. S. Anderson, endangered languages, language activism, linguistics, native american, new york times, Northwest Plateau, oregon, salishan, siletz, siletz tribe by livingtongues. Bookmark the permalink.